Inclusively promoting sustainable peace, love, harmony & education. Music lessons, score arrangement. and English tuition available. Contact mcpherson.douglas@gmail.com. To find a specific arrangement on this site, use "SEARCH" . (If I had a hammer) Scroll down for the sheet music and practice tracks. 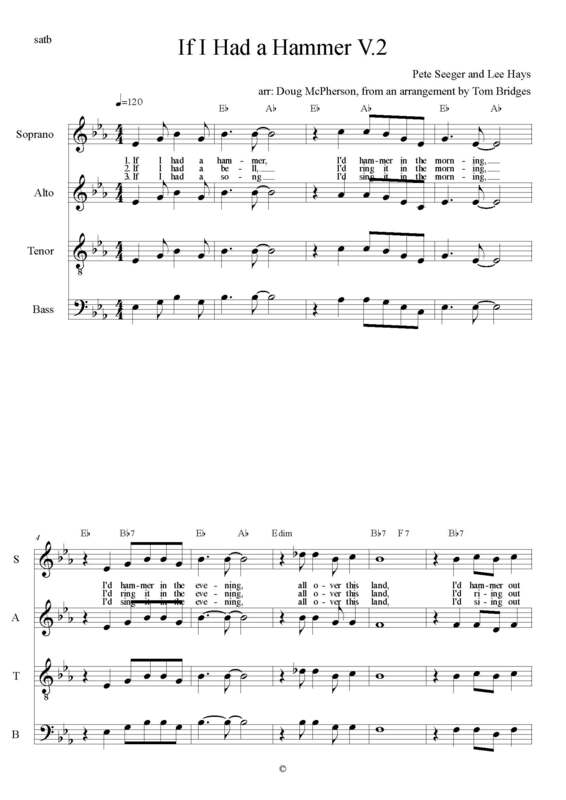 An arrangement for the Union Singers, of the song originally by Pete Seeger and Lee Hayes. -From an arrangement by Tom Bridges, for 4 voices, all 4 verses. Download the sheet music, in the original key of E flat, as a .pdf file here! Download the sheet music, in the key of D, (for guitarists, capo on the1st fret to play along with the E flat practice tracks), here! Key of D (Capo 1st fret to play with practice tracks). A suggested practice strategy is to practice your part on it’s own, and then against an “all parts” track. These first 2 tracks are in straight 4/4 time. The next tracks are in “swing” time. Click here for the easier 2 part version. For the (slightly) more difficult 4 part arrangement click here! 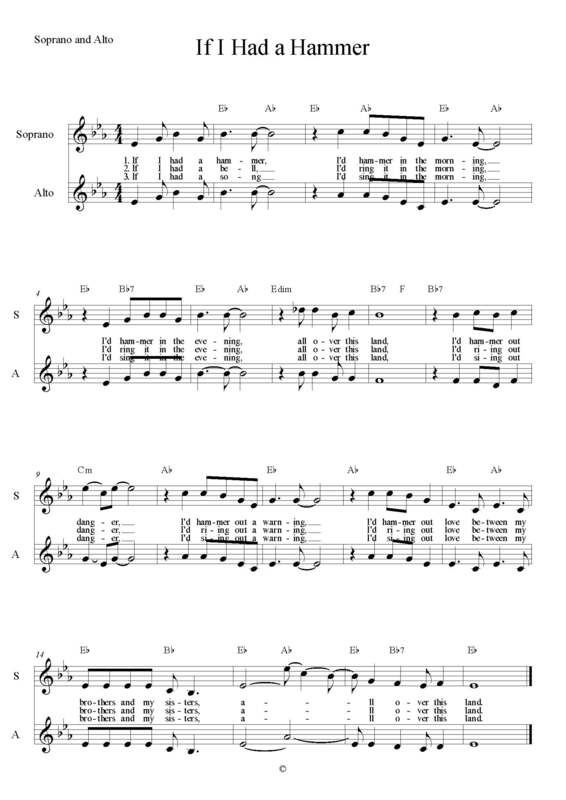 An arrangement for the Union Singers, of the song originally by Pete Seeger and Lee Hayes. -From an arrangement by Tom Bridges. Here is the music for the first 3 verses. The 4th verse could follow the same pattern. Scroll down for practice tracks. Download the Sheet Music, as a .pdf file here! Practice tracks. Practice one part first, and then sing that part against all parts. Click on the track title to download.